Scientists believe that all domestic dogs descend from a single pack of gray wolves that roamed China about 15,000 years ago, and all domestic cats descend from five felines that lived in the Middle East more than 100,000 years ago [source: McGourty, BBC News]. But with so much evolution between today's pets and their ancient ancestors, should Spot and Whiskers be eating the same raw food diet as their forefathers? This question became an especially hot topic of debate after a 2007 recall of more than 100 brands of processed pet food in the United States. The concern was over food containing wheat gluten contaminated with melamine, a substance used to make plastics and fertilizer. About 2,000 dogs and 2,000 cats died from ingesting tainted food [source: Mann]. 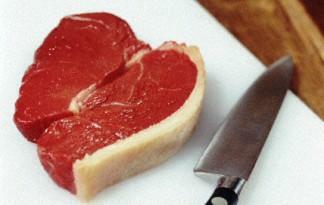 Before you go out and get your pet a T-bone to munch on, consider the risks and drawbacks of the raw food diet. Foremost among these is the threat posed by Salmonella and E. coli. Present in a frighteningly large percentage of raw meat, these bacteria can cause illness and death in animals. Owners can also become infected either through direct contact with meat or through indirect contact with pet feces. Raw bones can also be hazardous. They can chip or fracture an animal's teeth, or worse, shards of bone can break off and get lodged in, or puncture, its gastrointestinal tract. Experts also question the nutritional value of raw food diets, specifically the balance of potassium, calcium, phosphorus and zinc they provide. Finally, raw food diets are expensive. Owners can expect to pay upwards of $70 a month for raw meat, fruit and veggies, while processed food can cost as little as $10 a month. If, after considering the benefits and risks, you choose to put your animal on a raw food diet, the switch can typically be made right away. However, if your pet is older or has digestive or immune problems, you'll want to introduce the raw food slowly. The key to the raw diet is variety, so there are endless ways to prepare it. A typical meal might include some type of meaty bone (chicken backs, chicken wings, turkey necks), ground meat (beef, turkey, lamb), organ meat (beef kidneys, chicken liver), whole eggs, pulverized fruits and vegetables, and supplements. For owners short on time, some companies sell prepackaged frozen patties with all of these ingredients already mixed together. Animals react in various ways to the new diet; some will eat everything you put in front of them, while others may never develop a taste for raw food. You'll have to experiment to see what they like. Remember to consult your veterinarian before making any major changes to your pet's diet.